Following a largely restive week in the Armenian capital, Yerevan, it required a little will-power to get back on the road, and continue this first visit of mine to the country. While I had enjoyed Armenia so far, I was beginning to tire of the numerous fine, medieval stone churches, and had no appetite to be among coachloads of European tourists. I wanted something a little more unconventional and adventurous. I would find these qualities in the more rugged south of Armenia where (after a final clutch of magnificent churches), I would visit lonely Bronze Age petroglyphs and stunning lakes high in the mountains. More interesting still however, would be my two visits to the de facto independent Nagorno Karabakh Republic, de jure an occupied swathe of south-western Azerbaijan but with a once intricate ethnic make-up more complex than I had imagined prior to visiting. 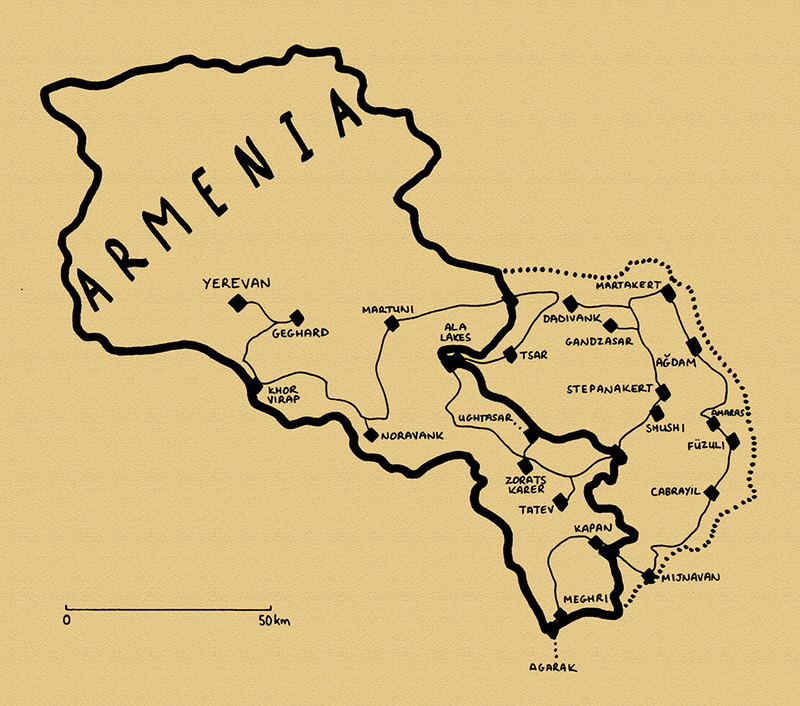 Here I would see both clear evidence of long-standing Armenian occupation (in yet more striking monasteries), but also sneak into areas which historically were clearly Azerbaijani; areas never part of the Soviet-era Nagorno Karabakh Autonomous Region, and whose towns and villages have been occupied and systematically destroyed by Armenian forces. This rather sobering encounter with the long-standing conflict in the Lesser Caucasus was a clear demonstration of the deep-seated antagonism between the two communities, and would form one of my strongest impressions of the small country of Armenia, before making a final drive to the country’s southernmost tip, and crossing the Aras River back into Iran. On the 22nd September 2014 I leave Yerevan after a very pleasant, week-long stay, and with somewhat limited enthusiasm drive east out of the city to the thirteenth century monastery of Geghard. Unlike any other Armenian monastery I have visited, Geghard is partly hewn out of the native cliff-face, and the quality of interior carving is breathtaking and to me hints at the pagan influence in Armenian Christianity. This however is tour-bus country, with elderly European tour groups, English-speaking hawkers and Russian tourists photographing each other. Armenian guides dole out their time-worn spiel, full of national pride, entrancing the diaspora Armenian tourists who relentlessly consume the culture of their ancestors. I’m just waiting for one of the guides to explain that Armenians invented fire. Very nearby, and part of the same tourist trap is the similarly impressive Garni Temple; wholly Greco-Roman in design, though given an Armenian touch in being constructed from distinctive grey basalt. 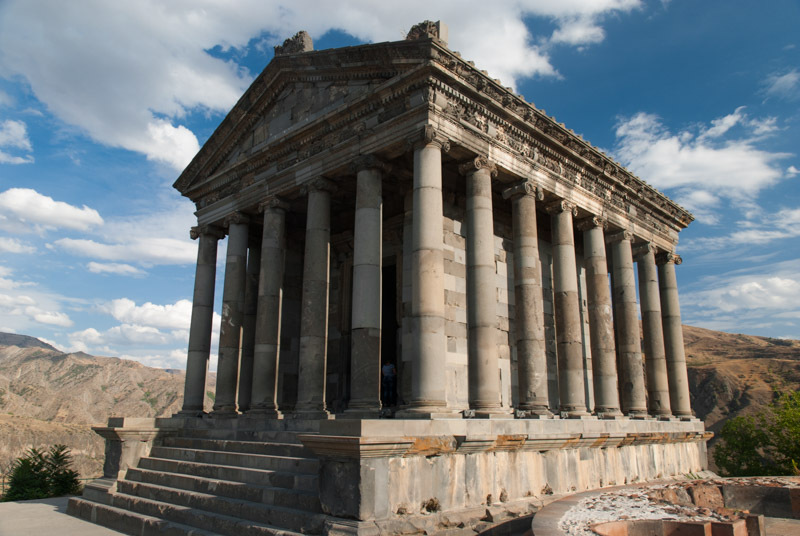 Garni, thought to date from the first century CE is the only intact Greco-Roman colonnaded structure in the Former USSR, though it was destroyed by an earthquake in the seventeenth century; what one sees today is a fine reconstruction completed during the Soviet-era. I like Garni for being different though, a refreshing encounter with a pre-Christian structure in Armenia. It’s late afternoon when I leave Garni and I make the mistake of taking the old Yerevan ring-road, which leads through a foul, sprawling, informal rubbish dump covering a hillside beyond the eastern edge of the capital. Shortly beyond, the land has subsided so dramatically that the asphalt has broken up like pack ice; in places, islands of asphalt have totally detached from the road, and skeletons of old houses lean at impossible angles. I finally emerge somewhere near Masis onto the main Yerevan – Meghri Highway, which is being reconstructed and is heavily policed, despite the absence of any road signs. The area is heavily polluted with factories spewing smoke into the air (conveniently close to the Turkish border) and I am glad to turn off the highway after dark and stop for the night in a field just a few hundred metres short of the Aras River, which here marks the Turkish border. I enjoy a cold Kilikia beer in the truck as lightning flashes in the clouds above me. 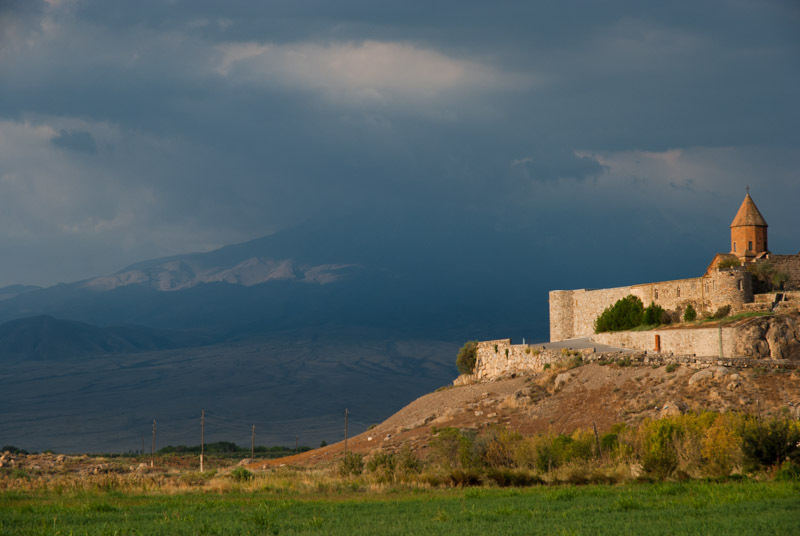 I am just below the seventeenth century monastery of Khor Virap, at the point which is as close as one can get to Mount Ararat – the national symbol of Armenia now – without leaving present-day Armenian soil. In the morning the view is disappointing; clouds, haze and smog (from the Armenian side) mean that the huge mass of Mount Ararat sits almost invisibly across the frontier. I can’t bring myself to visit the monastery, and so resume my journey, almost as far as the border with Nakhchivan where I had been six weeks earlier. 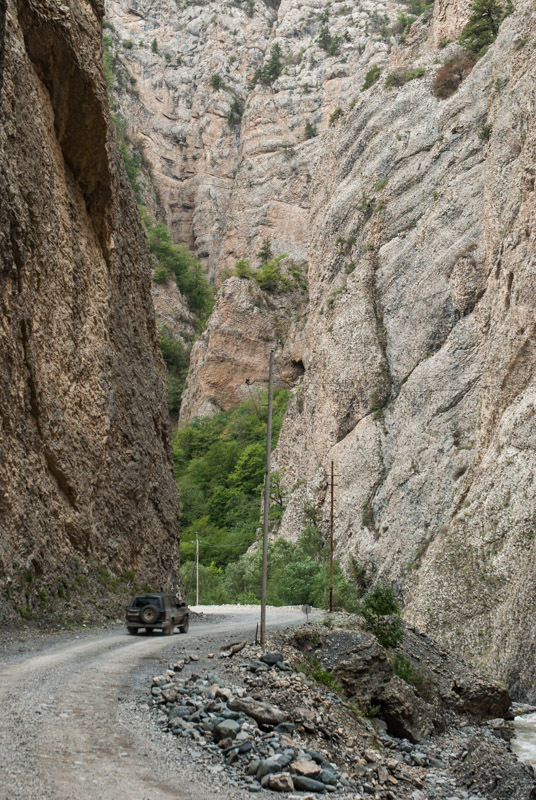 The road then leaves the Aras Valley and climbs towards the mountainous south of Armenia. Dropping into the Arpa Valley, I take a side road and climb up to Noravank Monastery. Despite having had my fill of churches I am genuinely impressed by those of Noravank which have perhaps the most dramatic location of any I have seen in Armenia, sitting below a sheer cliff of flaming red rock. The churches which make up the monastery are also highly notable, with the beautiful, fourteenth century Surb Astvatsatsin Church having an an unusual and intricate colonnaded tambour (drum) and the thirteenth century Surb Karapet Church having carvings of the Holy Mother with Child, and of God the Father, whose beard contains a small bird, and who holds the head of John the Baptist in hand, with a dove (the Holy Spirit) above it. 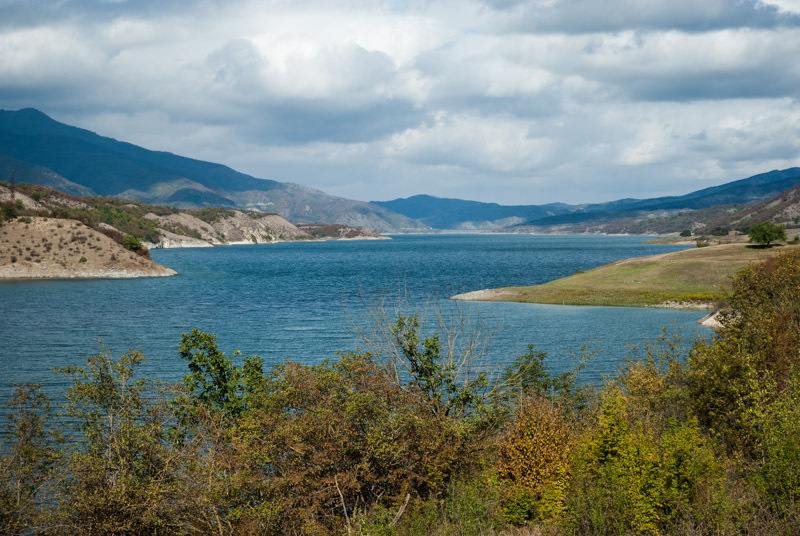 I proceed briefly further along the Yerevan – Meghri Highway, soon turning north towards Lake Sevan. I make another side trip to the village of Yeghegis, where there is an intriguing Jewish cemetery. Dating from the thirteenth to fourteenth centuries, very little is known of this Jewish community, and the thirty-odd gravestones, some covered in Hebrew or Aramaic script, were only uncovered in the last century. By late afternoon I am on top of the Varedenats Pass, where the landscape once again becomes beautiful, rolling steppe of yellow grass, and where one finds the beautiful black basalt Orbelian Caravanserai, a wonderful and complete relic of the Silk Road. Inside the highly atmospheric interior are two arcades of thick stone arches where one can imagine ancient merchants bedding down with their goods, the scene dimly lit by piercing ocular skylights with decorative stone carvings. Not far from the crest of the pass, the beautiful sapphire-blue of Lake Sevan comes into view again, perhaps my favourite sight in Armenia, and I find a nice place to camp at the lake shore with beautiful views, only slightly spoiled by the great quantities of litter left by local tourists. I look forward to the day when people who regard themselves as highly civilised can refrain from fouling their own surroundings. 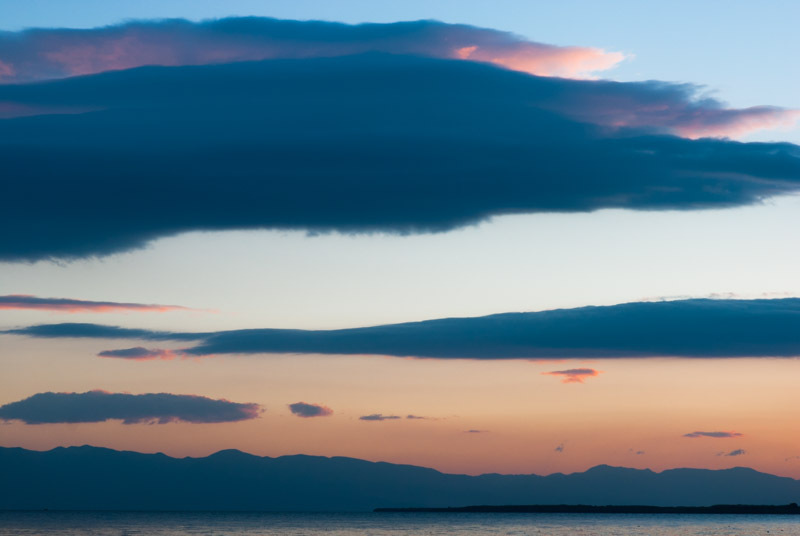 The following morning I drive around the southern edge of Lake Sevan, amid wide, open farmland, backed to the south and east by mountains. I stop on a pebbly beach on the eastern edge of the lake and watch a squall come in from the now steely-blue waters, blowing leaves off the poplar trees growing on the lake shore, a sure sign of the approach of autumn. 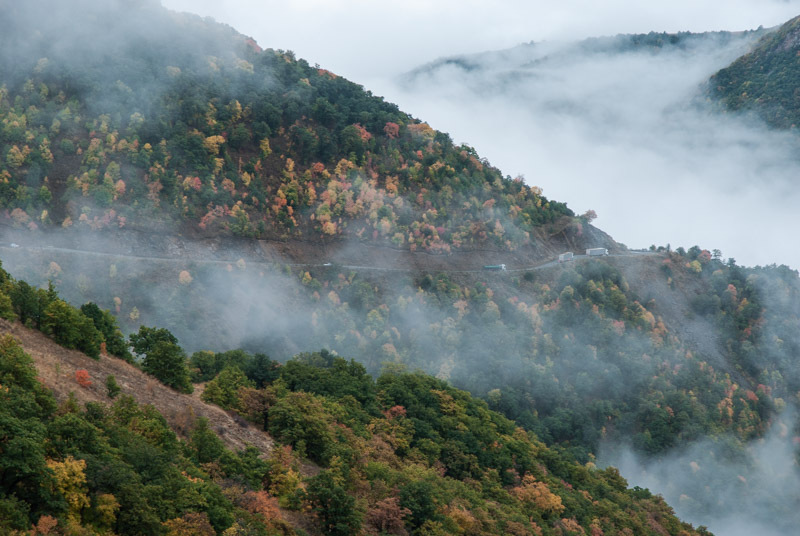 After stocking up on food and fuel in the town of Vardenis, which has something of a frontier atmosphere, I climb eastwards on a surprisingly good road towards the Sotk Pass, which marks the border of the Nagorno Karabakh Republic. When applying for my visa back in Yerevan, I had been told that it was forbidden to enter ‘The Republic’ (which is internationally unrecognised, even by Armenia) via the Sotk Pass, but I wish to try regardless. After crossing the pass, which overlooks a huge slope of rubble generated by the Sotk Gold Mine, I descend into the forested hills of Nagorno Karabakh, a dramatic change in environment from the treeless, volcanic steppe around Lake Sevan. At a check post in the Levonaget Valley I’m waved straight through and soon after turn off the road and begin climbing up the Tartar Valley, towards the town of Karvachar (Kalbajar in Azerbaijani). Nagorno Karabakh has a convoluted and contentious history of control between Armenians (who were undoubtedly first on the scene) and Muslims, the latter becoming vassals of the Persian Empire and progenitors of modern Azerbaijan. Control switched from Persian to Russian Empires in 1820, but a century later, as the Russian Empire descended into civil war, Armenians and the newly formed Azerbaijan Soviet Socialist Republic were at war over control of Nagorno Karabakh. With Soviet control, the conflict froze, and Stalin’s vile gerrymandering of national borders within the USSR saw the creation of the Nagorno Karabakh Autonomous Region as an enclave within Azerbaijan. With glasnost in the late 1980s came a softening of the iron fist of the Soviet State and the re-emergence of suppressed nationalism, and as the Soviet Union collapsed, the Nagorno Karabakh War broke out, raging on until a cease fire in 1994. The current status quo sees most of the Soviet-era Nagorno Karabakh Autonomous Region under Armenian control, together with a roughly similarly-sized area of Azerbaijan which adjoins the Armenian and Iranian borders, linking much of the former enclave to Armenia as the de facto Nagorno Karabakh Republic. This north-western part of Nagorno Karabakh is one such area of occupied Azerbaijan, and after passing the half-abandoned town of Karvachar and climbing further up the valley, I frequently see the remains of houses and small villages; the population of the area has clearly been drastically and deliberately reduced. I camp for the night near some abandoned buildings, sticking to existing vehicle tracks and not straying far from the truck in fear of landmines, though some local cows come plodding through the area in the morning, indicating that the area is most likely not mined. Climbing further, past a sulphurous fumarole, I pass a dramatic cliff of basalt columns covered in striking orange lichen, then climb on steep, narrow switchbacks to the cliff-top village of Tsar. Dozens of destroyed buildings are spread across the hillside – this must once have been a sizeable place – but today just a few buildings remain inhabited. When I ask, locals confirm that Azerbaijanis used to live here. There’s a barrier at the end of the village, but after speaking with some locals, my passport details are recorded and I’m free to proceed. 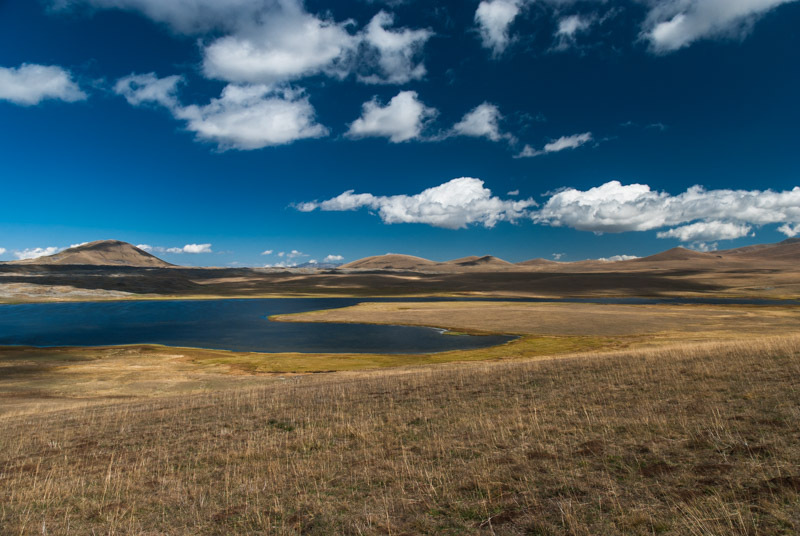 My aim is to follow faint paths which I have seen on satellite maps, to the high altitude Al Lakes, then drive over the mountains back into Armenia. 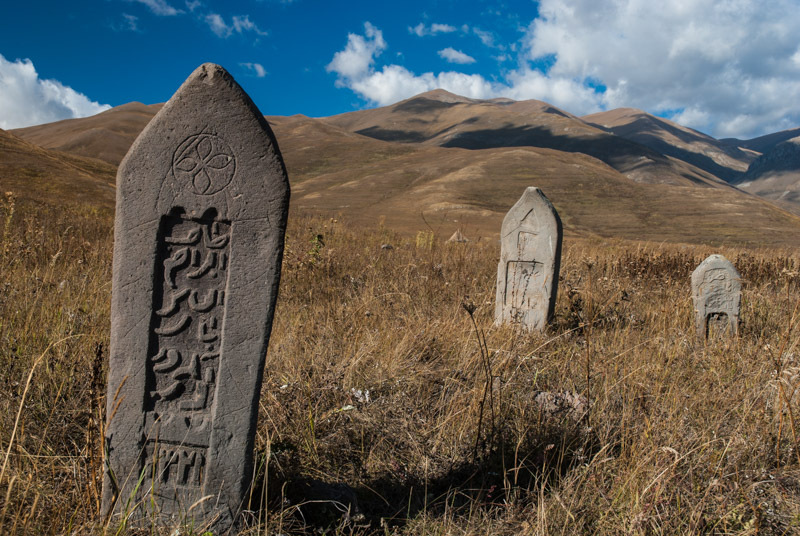 As I leave the village, I see an old Azerbaijani cemetery on the grassy hills; tall stones beautifully carved with Arabic script against a stunning mountainous backdrop, which although wonderfully tranquil is equally tragic given that the community has long since fled. The track I’m on is very seldom used – little more that flattened grass – and the only vehicles I see are a group of Soviet ZiL trucks which men are filling with cut grass, in preparation for the impeding winter. After some steep climbing I reach a wide, rolling plateau at an altitude of around 2700 metres, and just over two hours after leaving Tsar I catch the first glimpse of the magnificent Al Lakes; first Little Al then Big Al Lake, with a backdrop of the volcanic highlands on the Armenian border, below which is a dark, hardened lava flow reaching to the far shore of the lakes. It’s a magnificent spot, with just a few shepherds in Soviet UAZ vans and a camp of grass-cutters in an otherwise untouched wilderness. There are no signs of any tourists or their litter, and I have the satisfaction to have visited a truly remote area which I have never read anything about, but which has merely caught my eye when perusing satellite imagery of the region. Surveying the landscape, I see a likely-looking route over the mountains back into Armenia. Initially, I follow some very faint tracks, then must drive cautiously over the soft hills of yellow grass, crossing a small but deep and rocky stream (in which I bash the front axle of the truck) and descending on rough tracks strewn with volcanic boulders until I run into some shepherds on the Armenian side. After confirming that I am on a good path, I descend to the resort town of Jermuk, set amidst beautiful deciduous forest pocked by the first brilliant yellow and orange flashes of autumn but marred by an ugly concrete monstrosity of a Soviet hotel. Next day, from further east along the main highway, I climb into the mountains once again, back towards the border with Nagorno Karabakh. I take a wrong turn early on, and spend a couple of hours driving aimlessly across steep hillsides, but after considerable frustration retrace my steps and find the correct path, climbing steeply towards the prominent Ughtasar Mountains. After one unnervingly steep ascent on a loose gravelly track, with hair-raising drop-offs on either side, I reach the Ughtasar Petroglyphs at 3300 metres above sea level, which once again I can savour in complete, glorious solitude. 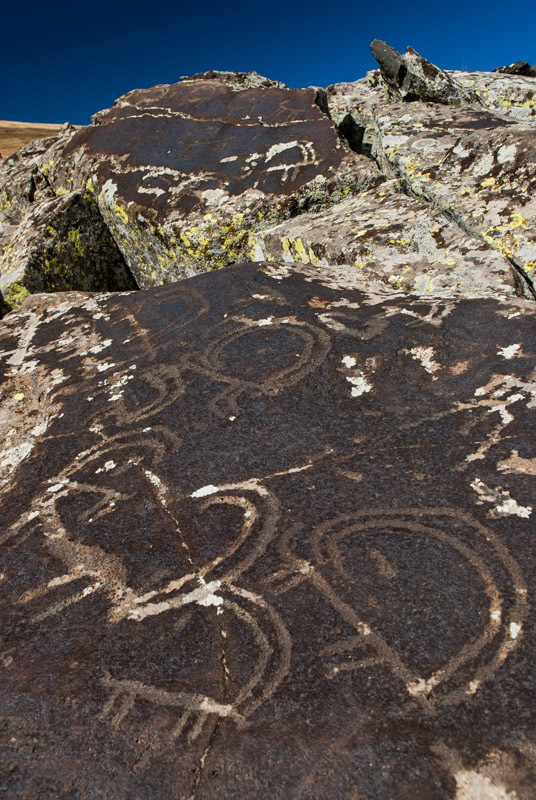 The petroglyphs are well worth the trouble taken to reach them; over a wide area, on large, smooth, naturally varnished volcanic rocks are hundreds of pictograms thought to span thousands of years. Many are of long-horned goats, but there also human figures hunting on horseback with bow and arrow, and a beautiful twin ox-plough. There are also more esoteric geometrical patterns and what may be shamanistic symbols, once again impressing me what seems to be a running theme in Bronze Age rock art spanning much of Eurasia. I spend the night back down near the main road and the following day take in another Bronze Age site known as Zorats Karer. This however is a large complex of standing stones; some arranged in a circle, some extending in linear arms, and some toppled or seemingly randomly located. There are speculations (spurred perhaps by Armenian national pride) that this is a very ancient observatory, which don’t believe in; to me the site resembles a large burial complex, particularly given the presence of numerous cists (slab-sided burial chambers) which can be found across Eurasia, through Kazakhstan and the Altai Mountains to Mongolia. Nevertheless, it’s an impressive and thought-provoking site and I wonder if its proximity to the nearby petroglyphs of Ughtasar is pure chance, or whether there was some ritual significance connecting the two sites. After a side trip to the impressively located, fortified Tatev Monastery, which overlooks the yawning Vorotan Valley, I return to Nagorno Karabakh, using the ‘official’ border crossing at Aghavno. The road is in near perfect condition, far better than any other I have seen in Armenia, and leads through the Lachin Corridor, another swathe of occupied Azerbaijan, crossing successive ridges and pleasant small towns and villages, before climbing into Nagorno Karabakh proper. Just after sunset I reach the capital, Stepanakert, and I meet my local contact Marut, who helps me find a homestay run by a very kind Armenian family who ply guests with excellent food and endless coffee and sweets. I walk around Stepanakert with Marut the following day, and find it to be a likeable place; while there are still the odd signs of war, such as bullet-holed apartment buildings and fresh war cemeteries, it is largely unremarkable, with a peaceful, pleasant and safe small-town atmosphere. The town is not unlike others across the border in Armenia, if a touch more Russified, perhaps from having had a large Soviet Army presence, or for once having had a mixed Armenian and Azerbaijani population with Russian as the lingua franca. I very much enjoy the homestay, where I am joined by Will, a British photographer and Ace, the Filipino nurse with whom I had made friends back in Yerevan. One night I am awoken by an odd shaking of my bed, which I initially assume to be from a passing lorry, but soon realise is an earthquake, which turns out to be of magnitude 5.3, located 190 kilometres away in Azerbaijan proper. Close to Stepanakert is Shushi, which in contrast feels quite tragic. Clearly once an elegant city and cultural centre, Shushi calls to mind war, dereliction, ethnic cleansing and poverty. Among many abandoned and bombarded buildings, two once beautiful mosques, the Upper and Lower Govhar Agha, stand with sentinel minarets of beautiful, red and buff brickwork, poking above the straggling ruins of various other civic and civilian buildings. Neither are of course active, and the balconies of the minarets of the latter seem now to be used only by idle teenagers. There can be almost no prospect for employment in Shushi, and it seems that much of the population is elderly and penniless. Clearly once a beautiful place, I wonder what these old folk think of the age-old conflict, and whether they were really part of it, or just swept-up in the politics of inter-ethnic hatred. One moustachioed old lady rants madly at me as I take pictures of the minarets. Two roguish old drinkers cheerfully ask me for some money for a bottle. Sitting in a pavement bar a little later on, an old man confirms that this was once a beautiful city, then draws my attention to an Arabic inscription outside one of the mosques, and tries to convince me that it is French. The church of course, has plenty of cash, and Shushi’s Ghazanchetsots Cathedral, recently restored, is one of the largest Armenian churches in the world, here totally at odds with the city’s appearance. On the street outside, a very well turned-out, perfumed priest steps out of a brand-new, black Landcruiser. How he, a man of faith supposedly living a pious life can do so seems to embody the parasitic decadence of organised religion, and the false legitimacy of the clergy. It’s ironic that while Lenin and Stalin helped set up the tragedy which befell Nagorno Karabakh upon the collapse of the USSR, they were never actually able to rid people of the clergy. It once again takes some effort to leave the homestay and new friends in Stepanakert, but I am excited to break away from the capital region and head east towards the front line, to areas of the republic which I had been told by the lady who issued my visa in Yerevan were ‘not open to tourists’. I drive out of Stepanakert on what would once have been the road to Baku, soon reaching the town of Askeran where the road passes straight through the breached walls of the Askeran Fortress, built by the Muslim rulers of the Karabakh Khanate during the Russo-Persian Wars of the early nineteenth century. Backtracking very briefly, I pass through the small town of Ivanyan, better known by its Azerbaijani name of Khojali and infamous for the massacre of two hundred or more Azerbaijani civilians by Armenian (and CIS) forces in 1992. Today it’s a sleepy place, but a Muslim cemetery on the edge of town (next to what seems to be an army artillery range) stands in testament to its former inhabitants. 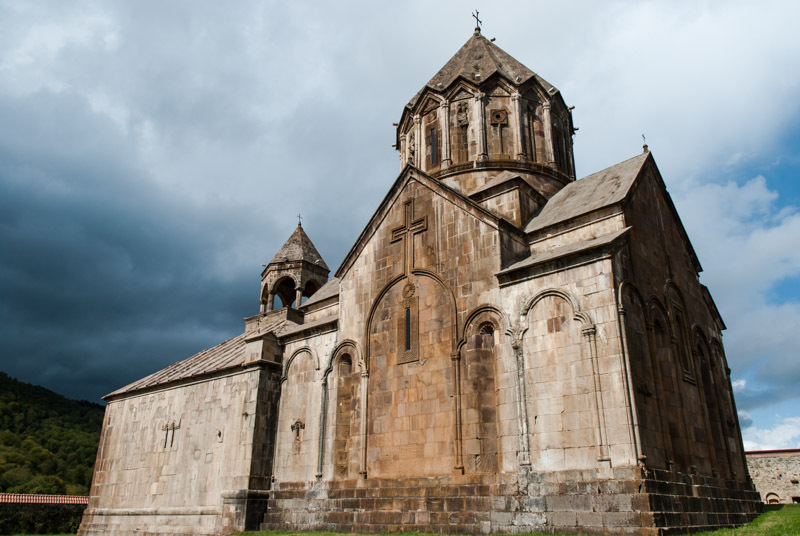 I wind north through muddy but picturesque countryside and slowly make my way to Gandzasar Monastery, whose thirteenth century Cathedral of St John the Baptist is the finest church I see in Nagorno Karabakh and the seat of the Archbishop of the republic. 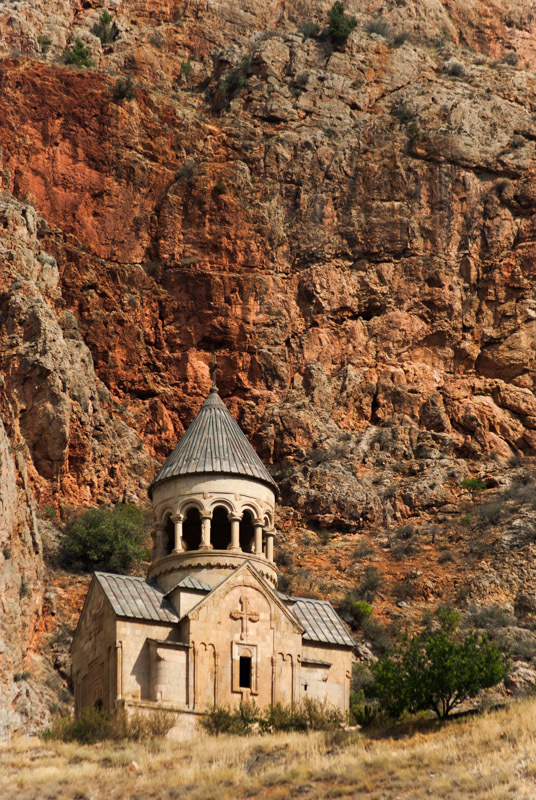 With a large, beautifully carved gavit (narthex) and faceted dome on zigzagging gables, located on top of a hill, it is unmistakably Armenian and a clear demonstration of the long-standing Armenian presence in this fractious mountain land. I cross another range of mountains north of Gandzasar, descending to the edge of the inky-blue Sarsang Reservoir, in the Tartar Valley which I had climbed out of days earlier towards Tsar and the Armenian border. I drive on the rough valley road west to see Dadivank Monastery, nestled picturesquely in deciduous forest on the mountainside. Thought to date from the ninth century, Dadivank is more Byzantine in style than other Armenian churches I have seen, with large stone walls, a terracotta-roofed chapel and thirteenth century frescoes, and is in the process of being restored following apparent damage from now-departed Azerbaijanis. I spend the night in the hills above Sarsang Reservoir, listening to the howling of wolves, then drive in the morning through tranquil beech forest towards the front line. Martakert, the regional capital is a town which bears the scars of heavy warfare, with destroyed buildings and chewed-up roads, and is a rather ramshackle, unattractive place. From this point onwards, I suspect myself to be in a restricted area without permission, and imagine I will be ejected from the republic or arrested for being here, so I intend to keep as low a profile as possible (which in a foreign-plated, military-beige coloured vehicle is probably not very low). I have to ask directions to find the only road heading south out of Martakert, such is the state of the city, but very soon I’m rolling down onto the plains on a road which parallels the front line at a distance of a few kilometres. Off to the east, the land recedes from the hills of Nagorno Karabakh into Azerbaijan proper, spreading in a hazy flatness towards the Caspian Sea. There’s a swathe of cultivated land along the roadside, out of range of Azerbaijani snipers, and then the trenches of the front line, looking not unlike the Somme, where soldiers have faced each other in a twenty year-old cease-fire, occasionally picking each other off. 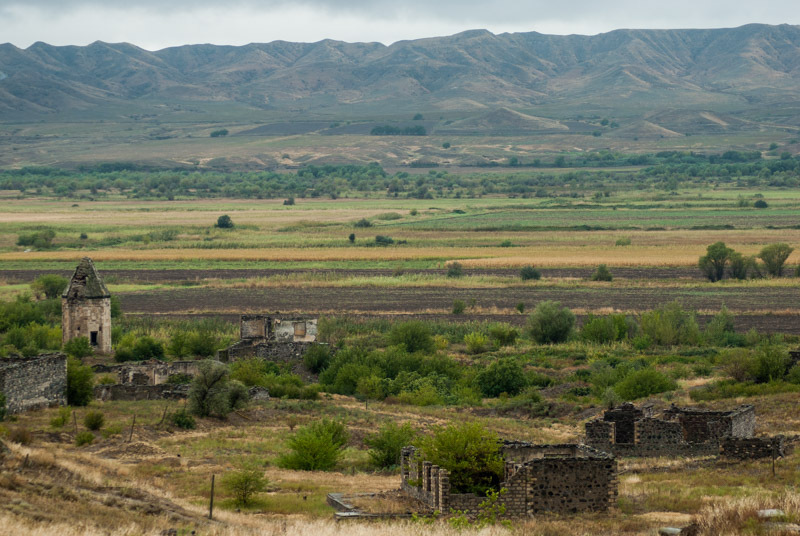 Beyond that, out of the reach of Armenian bullets, the land reverts to the rich, irrigated fields of southern Azerbaijan and, on the horizon, I can see neat, whitewashed Azerbaijani villages. It’s something of an illicit thrill to drive here. Heading steadily south, I pass a few ruins; a collapsing memorial to the Great Patriotic War (there seems some rather idiotic irony to a memorial dedicated to an earlier war damaged and neglected due to a subsequent war), an octagonal Muslim tomb and wrecked vehicles, and then Shahbulag Castle, an eighteenth century stronghold also built by the Khans of Karabakh. The road then reaches an intersection; the asphalt veers to the right, back towards Askeran and Stepanakert, but I continue straight to the destroyed city of Ağdam. 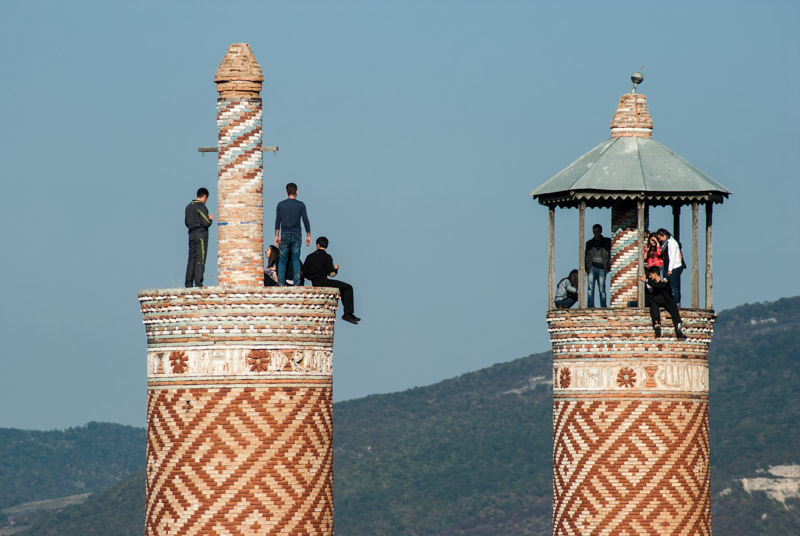 I am worried to pass a rambling army base just north of the former city, but all I get is friendly waves from bored-looking conscripts and so I continue, bearing for the twin minarets of Ağdam’s nineteenth century mosque, built by the same architect as the two Govhar Agha Mosques in Shushi. I climb the eastern minaret to the upper balcony where once the muezzin would have called the azan. I’m surrounded by quite a moving scene; an entire city systematically destroyed, building-by-building, leaving only piles of rubble, disconnected patches of asphalt and mature trees gradually taking over the old city layout. All the colour of life has left the city – aside from the red, buff and blue of the minaret’s tilework – leaving a doleful monochrome. A plaque outside the mosque simply names it a ‘Persian Mosque’. Two gruffly friendly men join me at the top of the minaret and ask me what I’m doing, perhaps checking if I’m a journalist, but their suspicions seem soon to be allayed and conversation switches to the truck, and how much it’s worth, and if I fancy selling it. A few of the soldiers are milling around the ruins, but none approaches me. Nevertheless, I don’t stay too long. I find the road south out of town, which passes under a disused bridge for the old Stepanakert – Yevlakh railway, now devoid of rails or sleepers, and a number of other destroyed, presumably Azerbaijani villages. The road turns south east, still tracking the front line, but here there are no ploughed fields to my west, just a wasteland of tracks and destruction. Life returns at the Armenian town of Martuni, which is slightly less shabby than Martakert, but worried that I’ll be apprehended, I push on. I take a turn off the road, west into the foothills, passing through the picturesquely situated mountain town of Chartar which has an excellent new road, and is the liveliest place I have seen since leaving Stepanakert. It reminds me of an Iranian mountain town and makes me think how wonderful a place Nagorno Karabakh might have been, but for the war. I don’t stay long on the main road, but turn south again through villages to reach Amaras Monastery, located on the edge of the hills, overlooking the troubled plains. Amaras is unprepossessing to look at, but has quite some history; said to have been founded originally in the fourth century by St Gregory the Illuminator, patron saint of the Armenian Apostolic Church. It is also said that Mesrop Mashtots established the first school to use his Armenian alphabet in Amaras. The monastery came to be abandoned and by the early eighteenth century was used as a Russian frontier post, and I assume that the formidable stone defensive walls date from this period. The monastery was reclaimed by the Church in the middle of the nineteenth century and the monastery’s sole church dates from this period, its walls now pocked with bullet marks from the recent war. 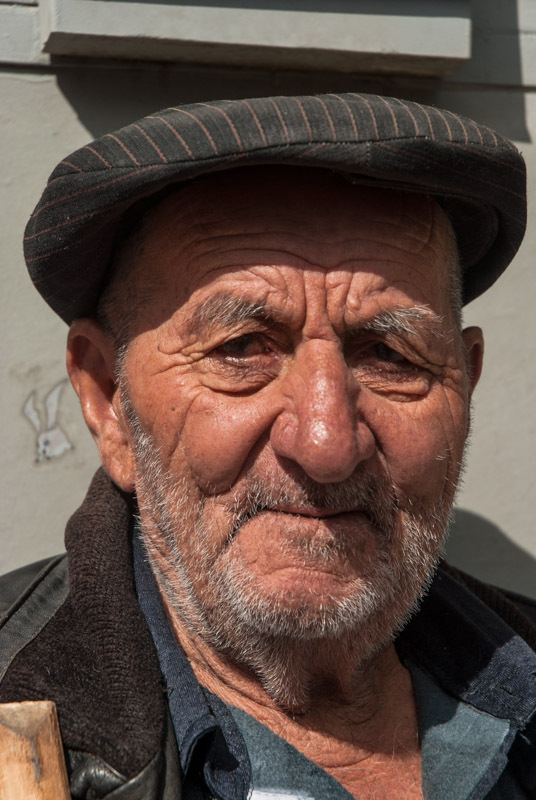 I speak to a gentleman living in a home atop the monastery walls, who offers me lunch and points the way to what used to be the town of Füzuli, across the rolling fields, which he reassures me are free of land mines. It’s a nice drive across the fields, aside from the sight of yet more destroyed villages, but Füzuli has suffered the same fate as Ağdam; scorched earth and rubble, with even the cemetery appearing vandalised, the city unpopulated apart from the odd squatter or shepherd. 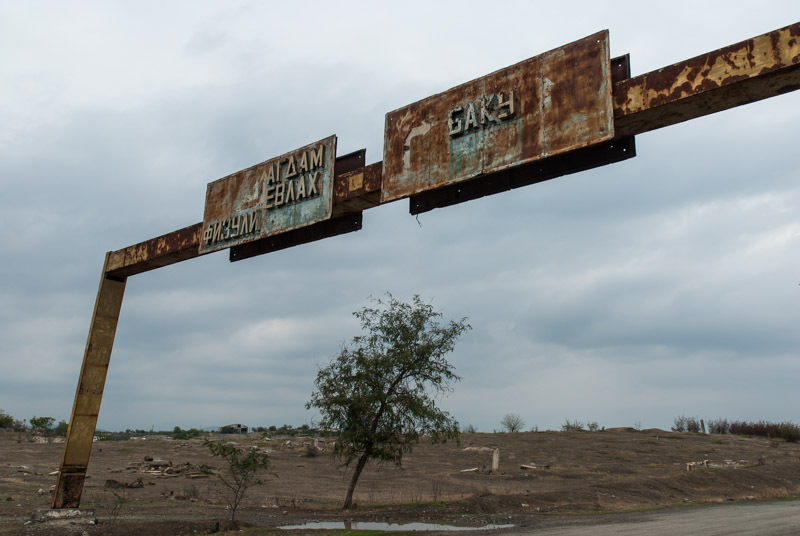 On the southern edge of town I find a rusted gantry across the road with Soviet-era road signs, which I find highly poignant, for the destinations – Baku, Yevlakh, Ağdam, Füzuli – are either in unreachable Azerbaijan, or literally wiped off the map. South of Füzuli, I reach an intersection where two traffic police sit in a Russian UAZ, but they pay no attention to me as I continue south towards the Iranian border. The road becomes rough as I start to climb gently into barren rolling khaki hills, and rain starts to fall gently. From Füzuli onwards, all is destroyed; systematically, house-by-house, save for the remains of old bus stops with their bright Soviet-era mosaics showing Azerbaijani folk dancers, and the occasional crumbling and pock-marked war memorial. This was very clearly part of Azerbaijan. Reaching the ruined town of Cäbrayıl, the road becomes an abandoned dual-carriageway partly overgrown with grass, and runs down to the Aras Valley and the ruined junction town of Şükürbäyli. From here, the road parallels the Aras Valley and the hills of Iran are visible to the south, shrouded in low, grey cloud. It’s getting late, and so I pull off the highway, drive through a muddy field where some farmers are just heading for home in a tractor, and camp in a clearing, hidden from the road and just a few hundred metres from the river. Even for someone who enjoys solitude and a sense of distance from crowds and cities, I feel extremely isolated and as I cook dinner and write down my impressions for the day, I watch the lights of the border posts and cars driving on the far side of the river, in Iran, where life goes on as normal. In the morning, after some difficulty in getting the truck out of my muddy camping spot, I continue westwards and reach the destroyed town of Soltanlı; again, razed completely to the ground. I spot a crude, concrete Armenian chapel on the road out of town, with icons and candles for passing Christians, which I find almost vulgar for its false piety in this land of vicious destruction, coming from a most unchristian, visceral hatred of another race. In the dull autumn rain, the bleakness of the landscape and utter desolation make for an almost eerie drive along the Aras Valley, as there is absolutely nobody around; not a single car on the road, no shepherd or soldier. 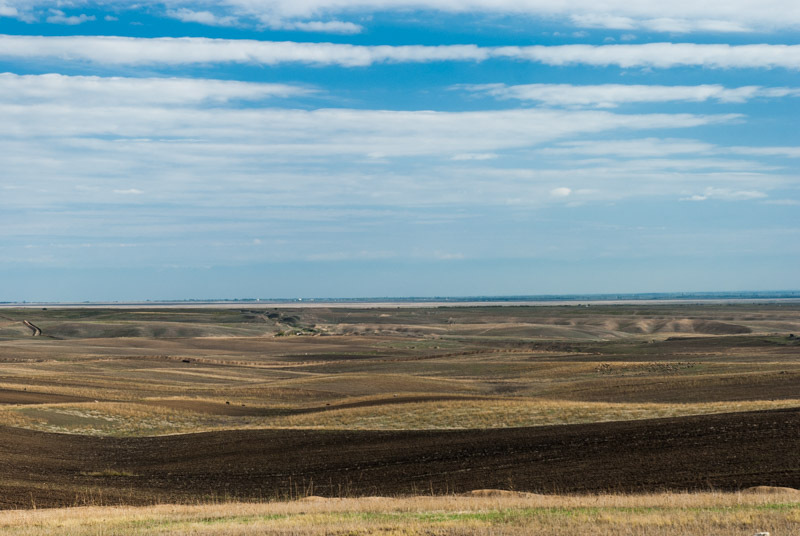 This land has simply been taken from Azerbaijan as a buffer zone, and left to decay. But as much as I find the circumstances utterly repellent, at the same time I must admit to getting a certain thrill from being the only person in an entire landscape, effectively driving along my own road. The Akari River, a tributary of the Aras, marks a suddenly lush, green swathe of land, and here I must take a slight diversion northwards owing to a broken bridge, driving on a smaller road which weaves through the rubble and detritus of more razed villages. One such village is Mämmädbayli with the octagonal, conical-roofed, fourteenth century Mausoleum of Yahya ibn Muhammad al-Haj finally drawing the eye to something other than destruction, and harking back to a more civilised time when this was braid of the Silk Road. Across the Akari, an Armenian population begins to slowly reappear and the land comes falteringly back to life. It’s late morning by the time I reach the town of Mijnavan (Minjavan), with a beautiful main street of mature plane trees masking the squalor and dereliction of the buildings behind. I could return to Armenia along the Aras Valley, heading straight towards Meghri and the Iranian border crossing, but chose to head north, through the ruins of Kovsakan (Zangilan) and along a valley of misty limestone cliffs. 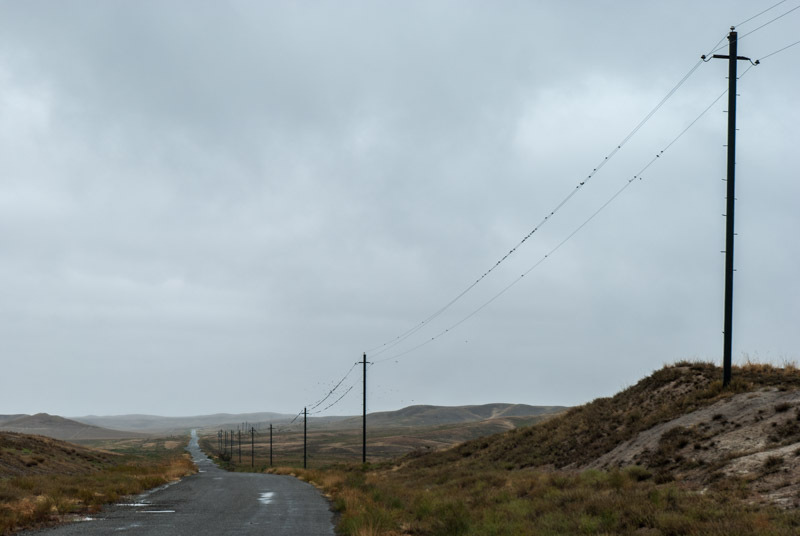 I cross back into Armenia at a point near a rubbish dump which is wholly undemarcated, and without any official presence, and slip back onto the Yerevan – Meghri Highway in the town of Syunik, as if I had never been nosing around in the forbidden frontier of Nagorno Karabakh. I stop in the damp and rather dour mountain town of Kapan to eat and change some money, then continue south through filthy mining towns and on through the beautifully forested Zangezur Mountains, which are just starting to turn to autumn colour. The road is slow, choked with Iranian trucks bringing goods into this isolated mountain country and badly driven Iranian cars weaving in and out amongst them, but it’s also highly scenic and I’m content at having seen a good swathe of Nagorno Karabakh without getting into trouble. 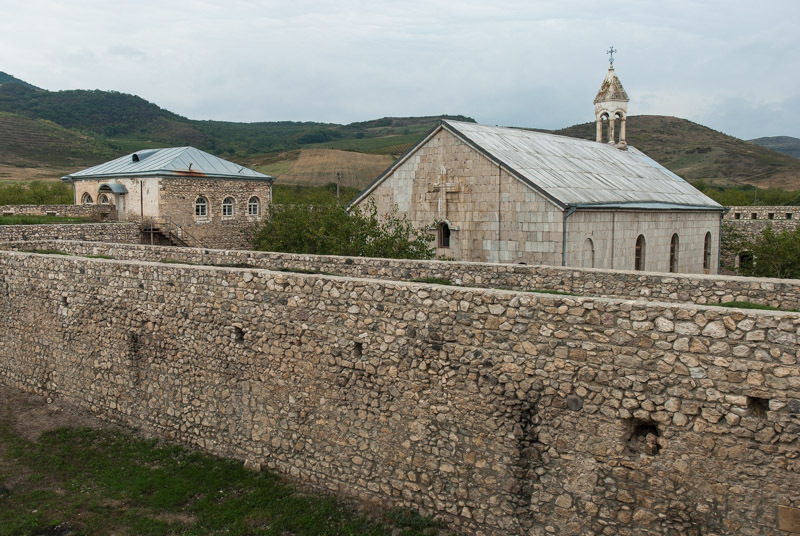 Meghri is the final Armenian town and is more attractive than Kapan, and the following morning I make a visit to one final Armenian church, the fifteenth century Mother of God Church which is highly distinctive, if slightly graceless from the exterior. 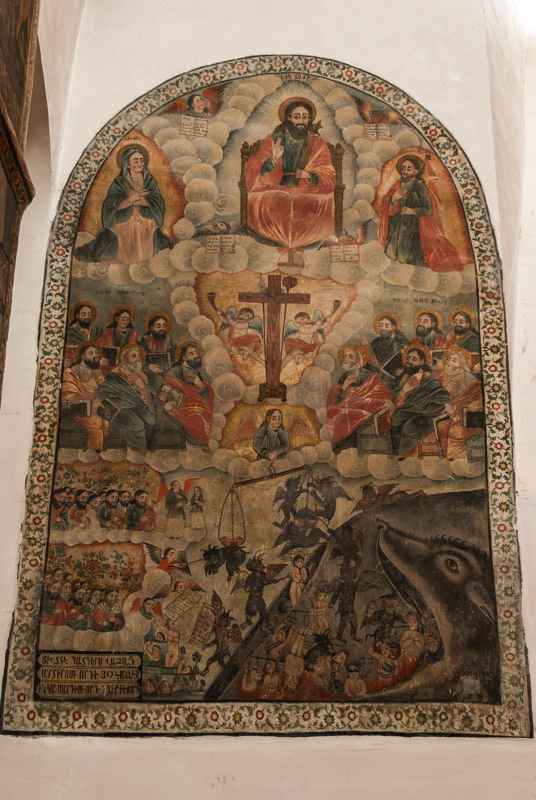 Inside are beautiful nineteenth century murals, including a magnificent scene of the Last Judgement, with vivid depictions of the demons of hell; unlike anything else I have seen in Armenia, though not unlike those of Vank Cathedral in the Armenian district of Esfahan, Iran. Just beyond Meghri, I’m back in the Aras Valley, directly above the river on a road running along the old Soviet border, which still has an impressive amount of barbed wire separating it from the rocky riverbank. After rather lengthy customs procedures at the Agarak crossing, involving paying yet more fees to the Armenian Customs Office, I cross the Aras and am ready to begin the next stage of the Odyssey, to Kurdistan and Northern Iraq. I’ve greatly enjoyed my time in Armenia, exploring the modern-day heartland of an ancient people with a breathtaking richness of culture; a people whose history has often been tragic, and who have been chased into an isolated and poor mountain heartland. It has also given me a chance to see for myself the reality of Nagorno Karabakh, one which has slightly changed my opinions. Previously, I had imagined that Nagorno Karabakh was ethnically Armenian, and wrongly ceded by Stalin to Azerbaijan (with the likely intention of fomenting ethnic rivalries). The reality however is more complex; there is clear history of a long-standing Muslim presence in the region; not just on the plains, but in amongst the church-dotted highlands. I can also sympathise more with the Azerbaijani cause, for areas which seem to me to have been undeniably part of Azerbaijan have been occupied, their inhabitants chased out or worse, and all their settlements deliberately destroyed to complicate any possible return. It’s all rather tragic for, in my imagination, Nagorno Karabakh could be a fascinating cultural melting pot and an enthralling destination to freely visit. But such is the reality in the Caucasus; this complex, feuding patchwork of nations and religions, where ethnic strife is far from a modern introduction. In this second lengthy visit to the region, I feel a sense of completion, having visited every republic both north and south of the great mountain divide. At the same time, I am sure that I will return again. First of all, I would like to thank you to visit my country Armenia and Artsakh(Nagorno-Karabakh). You seemed to have very unsually experience in Artsakh. But I would like to add some information what you wrote in your report. 1. You did mention azerbaijani-persian kahantes, but you didn’t give information when those territories are under control, such as, principality of Khachen and Kingdom of Artsakh. The churches are not all the thing Armenians built in there. There were lots of buildings which represents Armenian architecture. But thanks to the war lots of them are now destroyed. Bu the way, we are not just only the first settlers, we have a long- history in there. 2. You say there is lots of Cultural-Vandalism in Artsakh which is true. Probably(at least for me) it is a war tactics, but showing it is like only the Armenian-side did this is inappropriate. When you said that you can not see Armenian presence in the regions except Nagorno-Karabakh oblast, it is just because of Azerbaijani army destroyed structures(which have Armenian connection) like khackars and they did the same thing in Nakhchivan. On the other hand, you can see(luckily) some churches and buildings especially in Shahumyan region. Also, an additional historical information to you that Armenian presence are getting more less due to the exile prepared by Persian-Azerbaijani Shah’s in last centuries, Armenians were the majority in the past before Persian(or Azerbaijani) invasion. 3. Khojali massacre is an other event is consist of very inhuman acting and may their souls R.I.P. . But Azerbaijani army did the same thing to Armenians in Shushi and Maraga. You mentioned Khojali massacare when you travelled Askeran region, but while you travelled Shushi you didn’t mentioned Shushi massacares. To be honest with you, it is really sad to see that you didn’t include to your report that how Armenian people were suffered and survived from the war. 4. “The melting pot” thing is(sorry to say) not true. You just can’t live the people side by side who opperesed your people for centuries and ready to assimilate everything belongs to your culture. Especially, it becomes harder for both ethnicities who have different religion and one of them came from another region. I wish, we could indeed live in a harmony, but reality is much more different and I think everything written in this comment and in your report is enough to show how world and people are cruel. By the way, it is not impossible to make a peace. It can be happen when the both countries are ready to give up some of their lands and redraw their border lines. Thank you for reading my article, I’m pleased you took the time to write such a detailed and balanced comment in response. Firstly, I want to clarify that I am no expert historian; I read about the places I visit but what I write is largely based on my experiences at the time. Also, whilst there is no such thing as objectivity, I think I have a fairly neutral standpoint in the issues affecting Nagorno Karabakh; I am neither Armenian nor Azerbaijani (or Turkish), neither a Muslim nor a Christian, so please don’t feel I have some (conscious) agenda. I’ll try to respond to your comments according to your numbering. 1. I never question that Armenians have a longer standing presence in the region than Turks, this is a given as far as I’m concerned, not a point for discussion. I was more trying to show that there was also a historical Azerbaijani presence in places such as Askeran. 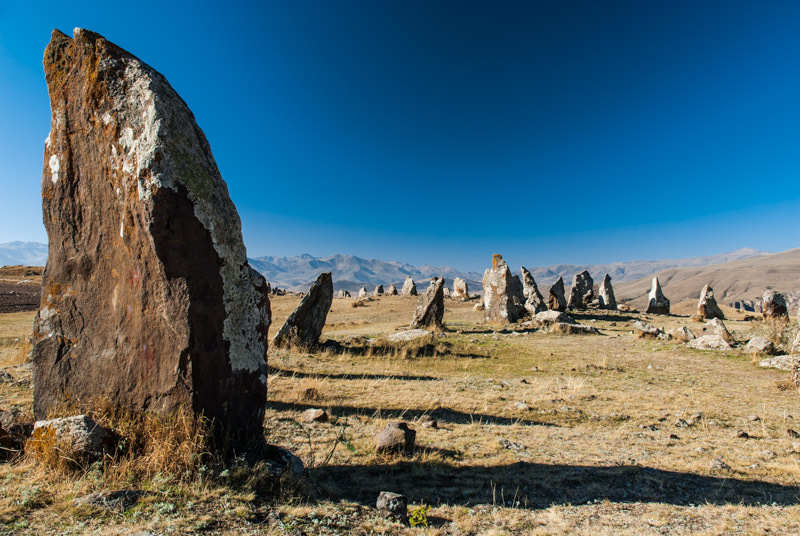 Maybe you’ve seen it already, but one of my slightly earlier posts (Stage 36) describes a trip through north-western Iran, Nakhchivan and eastern Turkey, a stage which I call ‘Ancient Armenia’ in reference to the region’s history. 2. When I refer to places such as Ağdam or Füzuli having been Azerbaijani, I mean to refer to their population before the war. I am aware of the destruction of Armenian churches and khachkars in Nakhchivan by the Azerbaijani authorities, a practice I find pretty pathetic. I have seen old pictures of churches in Nakhchivan. However, my impression is that places such as Ağdam and Füzuli were majority Azerbaijani before the war. What they were centuries ago is not directly relevant to the devastation one sees today. 3. Very good point, an unintentional oversight. I will make a mention of the Shushi Massacre. I had not heard of the Magara Massacre until now. Calling Ağdam’s Mosque ‘Persian’ is not really correct, as the architect was a Turk (not a Persian) and Ağdam was not in the Persian Empire at the time that it was built. 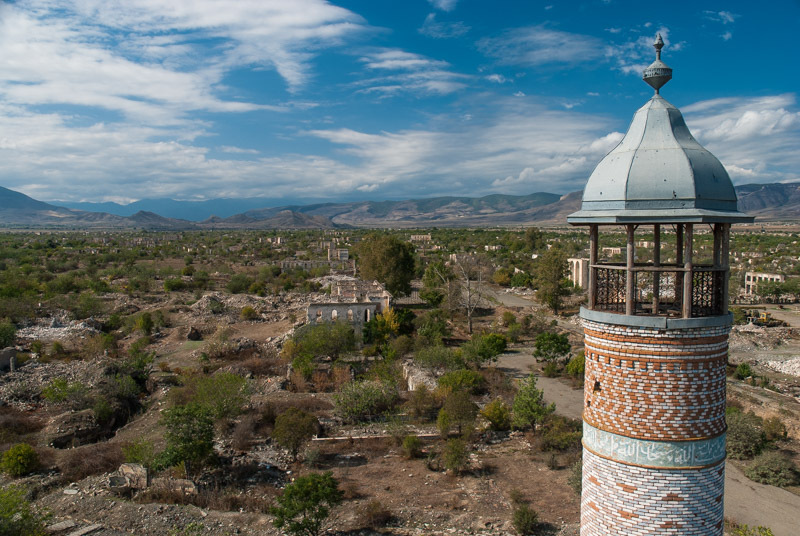 It’s good to hear that Shushi’s mosques will be restored. 4. The melting pot is wishful thinking at what a peaceful Karabakh could be. It’s not for me to say if it’s possible or not. The world seems to be becoming more intolerant and nationalistic, but human history is based on populations moving to new regions, often at the expense of the people who already live there. I hope Armenia and Azerbaijan can find peace one day, but I can’t imagine what the border might look like.